A Day, A Day of Glory! 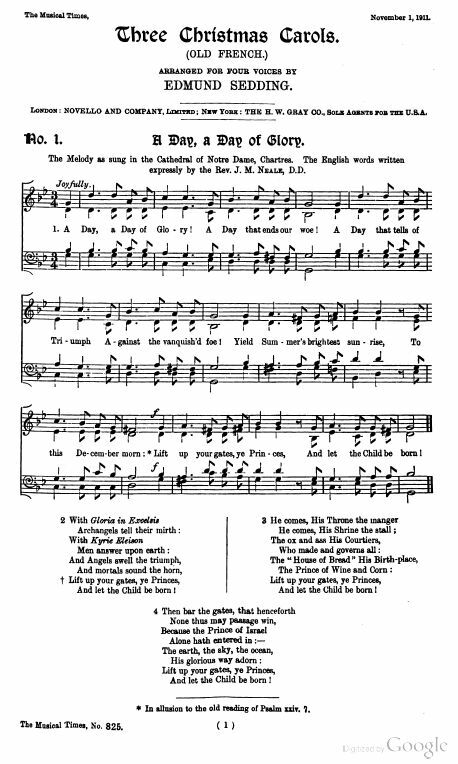 Music: Old French Carol, harmonization by Charles Wood", according to Rev. Hutchins. According to Edmund Sedding, his arrangement was "The Melody as sung in the Cathedral of Notre Dame, Chartres." Source: Rev. Charles Lewis Hutchins, Carols Old and Carols New (Boston: Parish Choir, 1916), #Carol 280. Also found in Mary Sackville Lawson, et al, eds., Collected Hymns, Sequences and Carols of John Mason Neale (London: Hodder and Stoughton, 1914), p. 308. 1. A day, a day of glory! A day that ends our woe! And let the Child be born! And let the Child be born. Sheet music from "Three Christmas Carols (Old French)," Arranged for Four Voices by Edmund Sedding. (London: Novello and Company, Limited; New York: The H. W. Gray Co.), reproduced in The Musical Times and Singing-class Circular, Number 825, Volume 52 (Nov. 1, 1911), printed between pp. 734 and 735. The other two carols were Masters In The Hall and Ye Who Walk In Darkness. Sheet Music from Hutchins, Carols Old and Carols New (Boston: Parish Choir, 1916), #280. Sheet Music from George Ratcliffe Woodward, The Cowley Carol Book, First Series (London: A. R. Mowbray & Co., Ltd., 1902, Revised and Expanded Edition 1929), Carol #37. "Tune: An Old French Carol, Harmonized by Charles Wood.